Reliable Freebies and Money Saving Offers: Shampoo Bars? I've been trying make a lot of changes lately to be more Earth friendly but when I was cleaning my bathroom the other day, I looked around and this is what I found: 2 bottles of shampoo, 2 bottles of conditioner, 1 bottle of body wash, 2 bottles of baby lotion, 1 bottle of baby oil, 3 bottles of my lotion, and a few tubes of Mary Kay products. All of these are not recyclable and will end up in a landfill. I was shopping for alternatives and ideas on how to reuse these products and I came across the magic word, Shampoo bars. Bar soaps are a perfect alternative to bottled products. They are cheaper and seem to last longer and they get you just as clean and nice smelling! 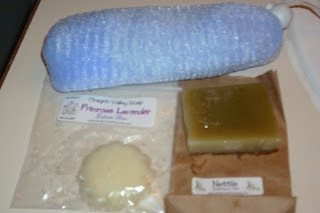 Bar shampoos are a little harder to find but I found a wonderful website for Chagrin Valley Soap and Craft Co. Chagrin Valley Soaps are all natural and handmade. They have a big variety of soaps for different hair types and needs. If you can't decide which one to get, all the soaps are available in a 1.5 oz trial size for $2.40. The full sizes are 6oz and cost from $6.00-$6.25. They also have lotion bars shaped like flowers that you rub on your skin! So I went shopping and this is what I bought: a small bar of lotion, a trial size of Nettle shampoo bar, and 2 soap-on-a-rope type loofahs. The picture of the products are posted above. I tried the shampoo bar last night. I was a little worried at first because the herbal smell of the soap was so powerful but once used, it did not leave a strong smell in my hair. The soap made a very nice lather and it was really fun to use. I did not use conditioner because I wanted to see if there was a slight chance that I could live without conditioner and guess what? My hair has not tangled even after sleeping all night with no conditioner! I have really long curly hair and sometimes, even with conditioner, it is a pain to brush my hair because it tangles so easily. I'm really happy with the shampoo bar and cannot wait to sample some other types and smells. The lotion bar was a little harder to use. It takes some getting used to to hold it and rub it on the skin. It was oily feeling at first but that seemed to go away after about 30 minutes and it left me moisturized so it did it's job. The Primrose and Lavender lotion is known to be good for skin with eczema so I think I will just leave that for my daughter. The loofahs are great because it exfoliates my skin and helps make the soap last longer. I think I am most excited about the shampoo bar because my hair feels and smells great and I can stop buying huge bottles of stuff that crowd my bathroom and the landfill. When you get the chance checkout Chagrin Valley Soap and Craft Co.